Choosing one single quote from this mind-blowing children’s book was quite the task. Should I select one of the innumerable humorous lines in the book? Well, out of context, they might not seem funny. So I opted for the most profound, pivoting moment of this children’s book. Since you don’t know what came before this line, I won’t be spoiling the book, yet the line stands on its own as a representation of the book’s profundity, despite its constant humor. 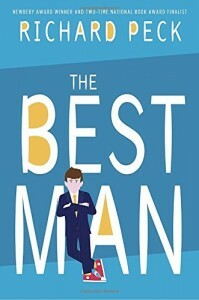 In the simplest terms, The Best Man is a middle-school story told through the eyes of a boy in sixth grade. It covers many of the real issues that middle-school children may face – bullying, teachers good and bad, cliques, change, parental divorce, and gender identity, just to name a few. You might think that list is too long for a children’s book. But the opposite is true. Because it covers everything, by the time you finish the book, you are living in the world that a modern middle school child lives in. Of course, there are some exaggerated, unrealistic scenes, but they are more for the humor than anything else. What can I say about my reading experience of this daring children’s book? First, I laughed out loud so many times that tears were running down my face. Second, I was totally blindsided by the gender issues that are raised so honestly, so caringly, that I found my own consciousness was changed by the time I finished the book. Because things came as a surprise, I don’t want to spoil the book for anyone. I do suggest that every parent read this children’s book first, before passing it on to their kids. There is so much content that will create fabulous parent/child conversations. I applaud Richard Peck for this amazing contribution to understanding today’s world, seen through the eyes of a pre-teen. This children’s book may not be for everyone – it is thoroughly modern, it is not a fairy-tale school where all is well, but it is an important, and in my opinion, a must- read book. I believe it could easily be read from ages 11 to 14.